If you want to make it in e-commerce, listen to these ladies’ advice. 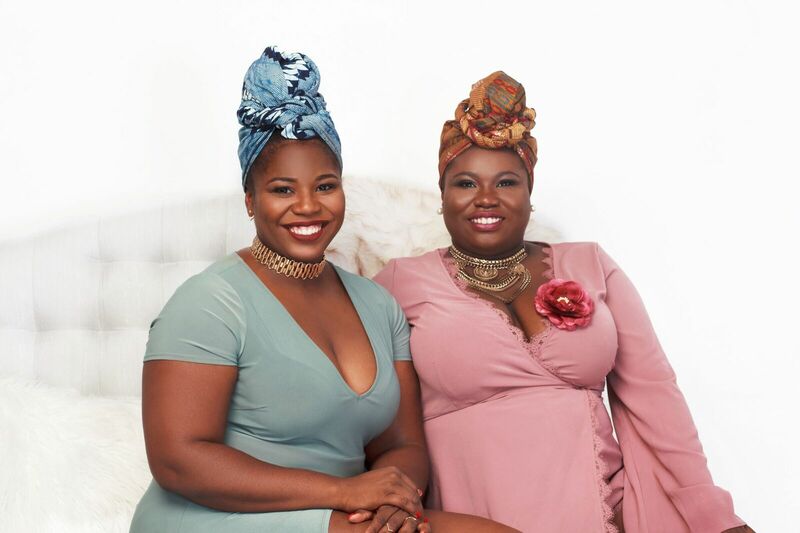 Working with family can be hard for some, but not for the sisters behind the popular West African fashion and accessories site, Cee Cee’s Closet. Currently based in New York City, Uchenna and Chioma Ngwudo, started their company in 2015 and have been on the rise ever since. Known for their head wraps and bags, Cee Cee’s Closet has attracted attention from a variety of social media influencers across the internet – including @alexandra_nx, @krissykakess, and @christinaporterj to name a few. In this interview with BAUCE, Chioma and Uchenna get real about what it takes to run an e-commerce business and how they’ve become stronger entrepreneurs over time. So give me the deets, ladies. Who came up with the name “Cee Cee’s Closet”? Take me back to the very first day that this started. Uchenna: CeeCee’s closet actually started out as Chioma’s closet — in reference to my sister. Shortly after my paternal grandfather passed away in 2015, Chioma traveled to Nigeria for the funeral. I wasn’t able to go because I was working in asset management, and I had a really brutal work schedule. Chioma always gets gifts for me whenever she travels somewhere and this time, she brought back several Ankara print clutches. She got a lot of compliments for the bags and decided she would sell some. So my aunt, who she had stayed with in Nigeria, brought some more bags back for her, and she sold some and was really, really excited. She asked me to help her sell some of the clutches and I agreed, but I felt super uncomfortable walking around at work, where I was one of the few women, trying to get men to buy them for their wives. I thought to myself if I want to do sales, it would probably be better for my personality type, since I’m a bit more introverted, to do something online. I came up with the concept of us having an e-commerce store and once I was dedicated to us having it, we sort of re-discussed the name. Chioma has this nickname for me where she calls me “Chenni”. Her name is Chioma, so we came up with CeeCee’s Closet. How adorable. But when people hear “Cee Cee’s Closet” it doesn’t immediately make you think of African prints, does it? Uchenna: Well, the name is super easy to remember. It’s kind of sing-songy. We love our heritage and what not, but if people aren’t used to seeing [African] names and it’s not in their common vernacular, it makes it harder to remember. It’s also part of like our branding and marketing approach if you will. Got it. How much did it cost to start your business? Did you use your own savings? Did you have any personal investors? Chioma: The cost of starting our business was the cost of buying our initial bags and setting up our website — so about $300. Uchenna and I have funded ourselves throughout. We invest money from our paychecks every two weeks to help sustain and grow the business when we started out. In the beginning of Cee Cee’s Closet, you were more of a platform to sell African accessories that were already created. How did you make the switch to designing your own products? Uchenna: I’m like a super deep creative. So I said to Chioma, you know what? Instead of us buying and selling things from Africa, I want to make things from scratch. So I came up with a design, and I created our first bag, went to Nigeria, found a contractor, made them, sold them on the website, and I was just like super, super excited. Very elated. Because that worked, I knew we were headed in the right direction, so we switched from the model of buying and reselling to designing, contracting the work out to artisans and then transferring them back to the States. Do you get sales globally? Can you share what countries sales are coming from? Chioma: We do get sales globally, which is so cool to us! We’ve sent orders to most countries in Europe, a few in Asia, and South America! Most of our sales do come from the U.S. and Canada. What is the most challenging aspect of running your business? What do you enjoy the most? Chioma: I think the most challenging part of running a business is balancing the demands of my 9 to 5 while also putting the time in to grow my business. There are not enough hours in the day to get everything I want to get done, done, and done well. But the excitement and passion I feel for building Cee Cee’s keeps me going. What I enjoy the most is meeting and interacting with customers! I love meeting people, and the amazing energy that our customers bring to pop-ups and the kind notes they send us about those orders of how our products make them feel, definitely makes my day every time! So, how big is your team? Like when you ladies started, was it just like you, your sister and one contractor? Uchenna: Yeah, so when we first started, it was like me and my sister and my cousin, who was kind of communicating to us what was going on in Nigeria. It was like super small and manageable. We had one contractor [building out our designs] at the time, so four of us. Once we started picking up business through the website and we started designing bags, we had to grow our team. We ended up hiring an operations assistant, additional contractors to create the head wraps and the other things that we were selling. We also have a team of people in Nigeria to source fabrics for us. You ladies pride yourselves on selling authentic, handmade West African products. How can someone tell if the fabric that they’ve purchased is fake or the real deal? Uchenna: In terms of Ankara, it’s like a long drawn out history actually of where it emerged from. But you can pretty much tell just from touching it and feeling it. It’s the difference in quality. So a lot of times, when people talk about our brand, they’re astonished by the difference in quality because what we find in Nigeria you’re not gonna find in the fashion district here in New York City. You’re just not going get it. So, I’m not going to lie. You ladies are popping up all over my Instagram feed! But it seems like it’s part of a very smart marketing strategy. How have you been able to grow your brand over the years? Uchenna: OK, so we actually decided to grow with a click-and-mortar strategy. We started taking e-commerce more seriously in November 2016, and it was like the height of the holiday season, but we didn’t know anything about e-commerce at that time! But we knew what people were attracted to. So at the time, Instagram was still pretty fresh. It’s very different from the way that it is now. It was a good way to market your stuff. I remember that I could post like a head wrap or someone wearing a head wrap and it would blow up right away. It was a good way to sort of like get people excited about our point of view, our brand, and our mission. I think we were able to not only build a following, but also introduce people to like our aesthetic and get them comfortable with how we choose to define ourselves. So, we take great pride and like in being heavily involved with the creative direction of all our photo shoots. And up until recently, we were shooting all of our photos for Cee Cee’s Closet. In addition to having our Instagram page that was pretty poppin’, we decided to do pop-up shops. We were doing markets all around New York City. I remember our first pop-up shop was in Bushwick, and we’re just so excited because immediately we could see like people like the quality and the idea of tying their hair with African fabrics. We were able to get feedback right away, and we found that [the pop-up shops] had a positive influence on our online sales. So even if someone didn’t buy something right away, they would eventually come back to our website and purchase. What is your advice for someone who admires what you do and wants to start a similar business? Chioma: My two key pieces of advice would be to trust your vision and ask Google first! People, who often mean well, will try to shape and change your business, but if you have a vision in mind, try to stay true to it and what sparked your passion. That is what will sustain you when times get tough (which they inevitably do). Google University is the best way to figure out how to do most things for your business. From finding out which website host to use, to figuring out how to ship your products. Research can help you figure out the answers to most of your questions or at least figure out the right questions to ask. This makes asking people for help so much more fruitful. Want to keep up with this dynamic duo? You can follow them on Instagram, Facebook, and Twitter.